Two patrons stood outside the First & Last Stop, a tiny hole-in-the-wall bar that sits slightly tucked on the corner of Pauger and Marais streets in New Orleans’ 7th Ward. Inside, the wooden bar, lined with red-cushioned bar stools with steel backs, awaited a crowd that would rush in 30 minutes later. On the two televisions in each corner of the bar, the New Orleans Pelicans struggled to get beyond a two-point deficit against the Oklahoma City Thunder. They never would. Each hole-in-the-wall in New Orleans is unique in its own right, but all carry the same familiar scent of faint cigarette smoke, stale beer and cleaning supplies that add a lemon-scented brightness to the tainted air. A look around the bar lets patrons know Mardi Gras is here. Purple, green and gold miniature foil curtains taped to the bar’s shelves partially hide the premium beer and liquor strategically placed at eye-level. “Set-ups”— one-fifth of a bottle of liquor served with your juice of choice and a container filled with ice — rests in the left-hand corner. To the far right sits a large jar of pig lips floating in light pink pickling liquid. The popular snack in New Orleans, generally eaten with Lay’s Classic Potato Chips, is ready for purchase. Photos line the walls throughout the restaurant. Individual pictures of the owners, friends of the owners, patrons as well as collages of Mardi Gras Indians line the bar’s left side, coming to a stop near a jukebox decorated with a purple, green and gold Mardi Gras wreath on top. Most of the photos feature late New Orleans legend Allison “Tootie” Montana, a big chief of the Yellow Pocahontas tribe who served as chief for more than 50 years. Before his death, Montana was the oldest person to continuously to suit up — or “mask” — as an Indian at age 78. It is as New Orleans as the traditional red beans and rice on Mondays — a dish that also tops the menu of the bar’s functional kitchen. In less than 15 minutes, the hole-in-the-wall bar would be transformed into what appeared to be the C Church of Mardi Gras Indians — an unofficial gathering, sprinkled with spirituality and storied traditions encased within century-long, ceremonial rituals. The tradition of Mardi Gras Indians dates back as far as 100 years. In New Orleans, the original concept of Mardi Gras, as everything else, was divided along racial lines. While white New Orleanians celebrated Mardi Gras following the traditional European carnival, black New Orleanians struggled to find a place in the celebration, leading them to slowly create their own. They decided to celebrate themselves. Along with the carnival traditions black people were creating, the Mardi Gras Indians were birthed to honor their African roots while paying homage to Native Americans who protected and assisted freed slaves, and sheltered runaways in their time of need. At the time, black people studied the traditions of Native Americans, even emulating the patch and beadwork of the tribes’ traditional clothing. A chest plate design by Chief Alfred Doucette. The first established Mardi Gras Indian tribe dubbed itself the Creole Wild West, and remains the oldest and largest tribe in New Orleans. Today, there are more than 40 tribes with a hierarchy system around New Orleans. In each tribe, the number of members depends on how many people are interested in either sewing, or helping sew Indian suits for Mardi Gras day. The tribe is led by the big chief, who oversees the operation and represents the tribe as they mask on Mardi Gras day. The big chief usually has a big queen and princesses there to support him and a Trail Chief to cover the big chief’s back. While walking around the neighborhoods in their beautiful regalia, the spy boy, another important position in the tribe, stands on watch about three blocks away from the big chief and looks for other tribes or gangs. If they’re worth the challenge, the spy boy relays the message to the flag boy, who normally stands with a large staff about a block away from the big chief and alerts the gang of the company within the area. The wild man, an optional part of the gang, clears a path for the big chiefs of each tribe to meet and perform against one another in streets on Mardi Gras day. The only other times many tribes may see each other in New Orleans is for St. Joseph’s Day, and a gathering known as Super Sunday, where they’re able to walk the streets once again in their suits. In the bar, Eric Burt, a drum chief and spy boy for the Washitaw Nation, arrives with his drum in tow. He’ll provide the Indian rhythms of the night’s practice. Members of various tribes pack in wielding tambourines. It was close to the beginning of the last Mardi Gras Indian practice before the big day. We are the Indians, Indians. Indians of the nation. The whole wide creation. We won’t bow down on the that dirty ground, because I love to hear you call my Indian red. The well-known chant, Indian Red, begins the practice that quickly moves into a fast-paced cadence with Burt controlling the rhythm. Although the lyrics of the chant are altered by different tribes, the message remains the same. The Mardi Gras Indians, united by culture, refused to bow down and fold to societal pressures. They can only be themselves. Authentic. Bystanders began to record the scene that was unfolding in front of them. Members of the tribes began to challenge each other: big chiefs against big chiefs, big queens against big queens. Spy boys take turns “battling” and wild men continually part the crowd to prevent the circles from closing in. And this is only practice. Patrons talk among themselves, many anticipating the day they’ll be able to see these tribes in full suits, masking on Mardi Gras day. Ronald W. Lewis, director and curator of the House of Dance & Feathers on Tulepo Street in the Lower 9th Ward, has been involved in the culture since he was 13 years old. 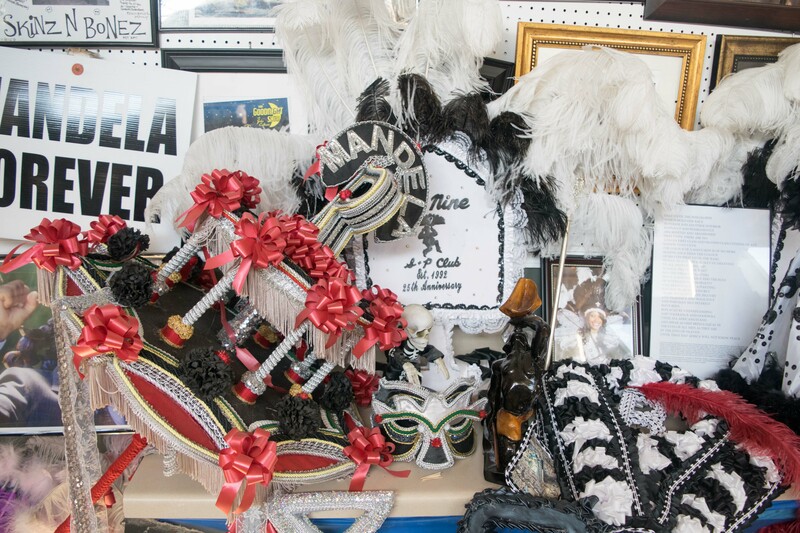 Walking through the small museum connected to his house and viewing Lewis’ Indian beadwork through the years gives tourists an idea of just how deep his love for black Mardi Gras history in general runs. Displays on the shelves of the House of Dance and Feathers. 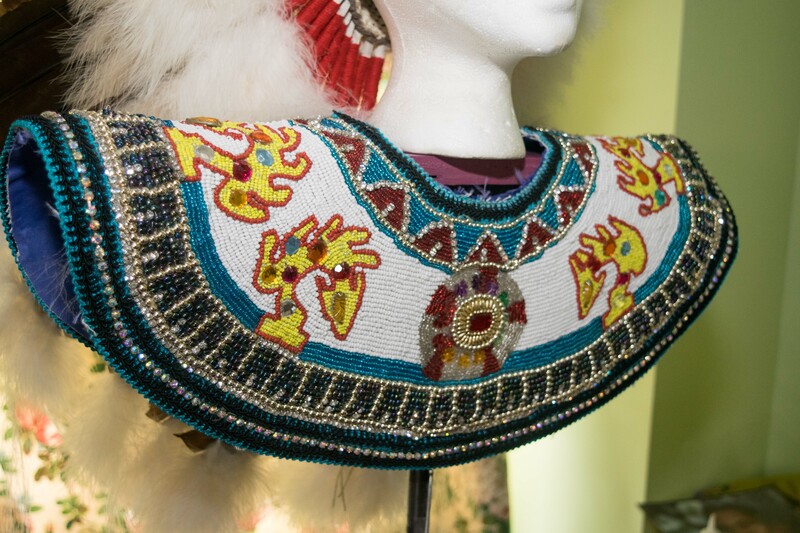 The beadwork uses both African and Native American beading styles. Depending on where the tribe resides — in the Uptown or Downtown regions of New Orleans — beadwork and patchwork may differ. In the early days of suit design, Indians would use turkey feathers, bottle caps and fish scales to design. As time went on, designs became more intricate, complete with rhinestones, sequins, and ostrich and chicken plumes. Some designs tell stories, and others are just a testament to the yearlong commitment that members of the tribes have taken to create these suits. Suits can weigh anywhere for 45 to 150 pounds and stretch as high as 15 feet tall. Alfred Doucette, big chief of the Flaming Arrow Warriors tribe, has been designing suits for nearly 30 years. His delicate beadwork and teardrop-style aprons on the lower half of the suit are generally themed, telling stories of what Doucette believes is important at the time. After masking in his first suit in 1988, Doucette said, he was recognized as a big chief. Though tribe members would love to make new suits every year, the expensive cost can hinder those plans for many. Still, Doucette believes tribe members should still sew with what they have. A beautiful suit can be designed with any materials, inexpensive or otherwise, but buying presewn materials are frowned upon. More than 17 tribes are represented in the small bar. Its capacity limit is being tested as the space swells with more people crowding the dance floor. About 150 people crowd the bar that seems to only be able to fit 80-100 people comfortably. The cool night’s air turns humid and muggy. The chants continue. The challenges continue. Not that the tribes are completely violent and untamed as they mask on Mardi Gras day, but the wars between Mardi Gras Indian tribes, or gangs, can be equivalent to rival sports teams suiting up on game day. Mardi Gras Indians want to be seen. It’s all about being the boldest. The baddest. The prettiest Indian around. As practice comes to a close, tribe members and patrons head home, excited and anxiously awaiting the day that Mardi Gras Indians will roam the streets, performing, taking pictures, and enjoying the spirits that come with Mardi Gras. After working hard to be the best for this one day, members of various tribes are most likely conjuring ideas for next year’s suits. Lewis, who no longer sews as frequently as he used to, still appreciates the beauty of the Mardi Gras Indians, and vows to be part of the culture for as long as he lives.